Great oversized building lot with easy access to Sconset Village, the bike path and golf clubs. Brush cut, staked, tagged ..
Steps from ‘Sconset village, this lovely home is complete with the charm of a beachside cottage- style but with all ..
One of the last remaining lots in the Baxter Road vicinity, this oversized 30,506 square foot parcel is serviced by ..
One of the last original Cod Fish Park fisherman cottages remaining in this charming beachside enclave within Siasconset Village. A .. Perfectly sited across from Sankaty Head Golf Club, this renovated custom built home offers stunning views of the ocean and ..
A picturesque 3 bedroom home set at the end of a beautiful, private shell drive lane in Sconset. 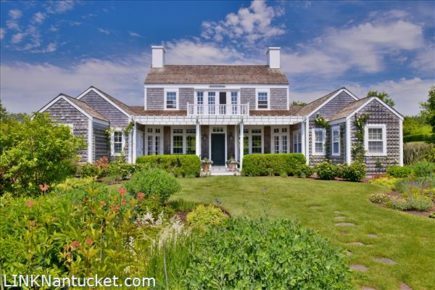 It is ..
Charming ’Sconset home only a moment down a quiet lane from both the beach and the ’Sconset Village. This family .. Rarely available property located in the popular enclave of Sankaty Village. This immaculately kept home is located on a private ..
‘Against the Wind’ enjoys panoramic views across Sankaty golf course and Sconset Trust conservation land to the prominent Sankaty Head ..
Heart’s Ease is a classic rose covered Sconset cottage, nestled in the village. Built circa 1710 and fully renovated in ..
An oversized lot with Town utilities, consisting of 39,251 square feet and ground cover potential of 4,906 sf. Located about .. Located just a short distance from the center of Sconset’s Main Street,“The Sheiling” is aptly named for this exquisite Ocean ..
SWEET ‘SCONSET COTTAGE – This delightful four bedroom, one bath cottage now has a fresh new look! A terrific covered ..
Charming ‘Sconset cottage with ocean views from a chair by the fireplace and water views from all but one room. ..
A stone’s throw from the village of ‘Sconset’s Main Street, this bright and airy home sits on an up and ..
Beautiful custom built home perched high on an expansive over-sized lot in the heart of ‘Sconset. With attention to every ..
‘Port Of Call’ Enhanced with views of the water and beyond create your own one of kind ‘Sconset retreat. A ..
Restful and Rejuvenating. Welcome to your chic coastal retreat! This attractive three bedroom, two bath home and one bedroom cottage ..
Garden whimsy. Private Sconset home surrounded by beautiful enchanting gardens. Abutting nearly 12 acres of walking trails owned by the .. Located in the village of Sconset. Opportunity to own a 3 bedroom, 3 bath air conditioned home. This home is ..
Well crafted new construction in Sconset. Thoughtful design and execution. Formal entry leads to a first floor master, large utility/mud ..
‘Mixed Doubles’ A delightful home in the heart of ‘Sconset, renovated with beautiful custom details and wonderful light spaces. Tucked ..
NEW CONSTRUCTION IN SCONSET Located on a quiet side street at the top of Main Street this property allows for ..